I opened a company using the 30 day free trial, and after the trial is up, the company stays in my list of companies, and it is impossible to change its name because it is expired. I now have two companies with the same name and I can’t change the expired company name to “My Company (expired)”, so I had to change the name of my “live” company to “My Company (REAL!)”. To do anything useful such as import CSV data or even batch-delete journal entries, I need to subscribe to an expensive a third-party application, TransactionPro, which seems to not have been updated in years. Because of the mix-up in company names (see above), I inadvertently connected TransactionPro to my expired company, then had to re-subscribe (at 20$/m) to change the company to “My Company (REAL!)”. 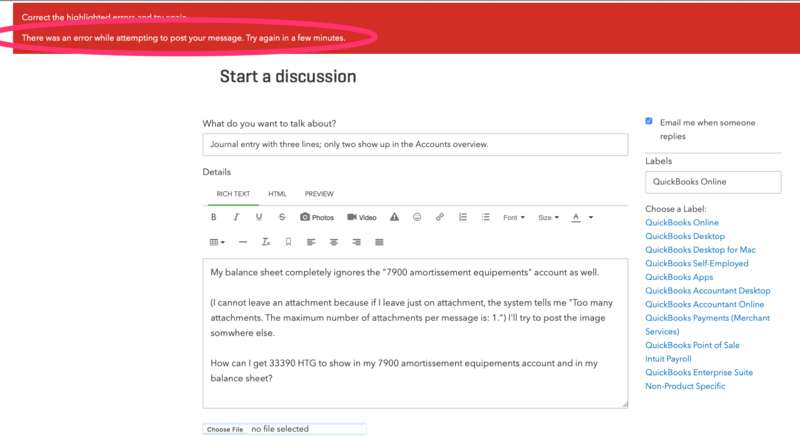 I figured I’d import a realistic number of journal entries (around 1500) using TransactionPro, see how it goes, delete the transactions, then try again until I get it right. Wrong! Batch-deleting journal entries is another 20$/month. I tried importing one journal entry and ran into issues right away. I’m no accountant so I figured I’d head straight to the Quickbooks Community and ask a question. But, using both Chrome and Safari, it has proved impossible to post to the Quickbooks community. I will therefore post my question here in the hope that someone from Quickbooks might use the contact form on this site to get back to me with an answer, or else I’ll just have to admit defeat in the face of Quickbooks, and go back to using Excel (my accountant will not be happy). So first of all, how do people post to the community site? 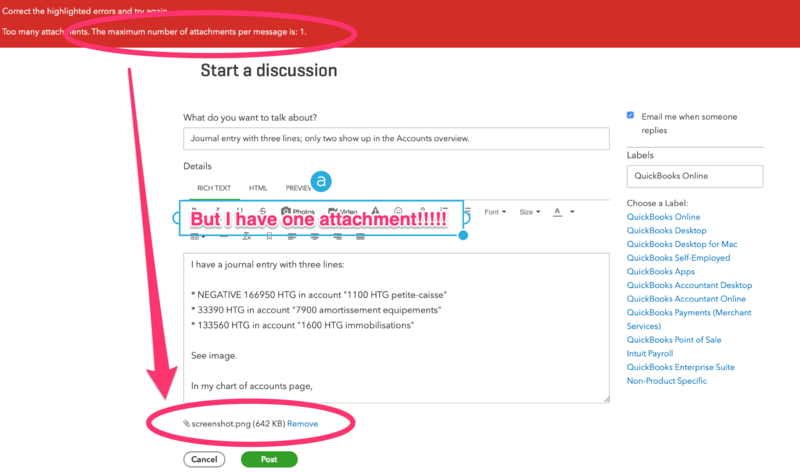 The maximum number of attachments per message is: 1. I’ll let you, the reader, imagine what happened after “a few minutes”. So here is my question, Quickbooks, is anybody out there? Journal entry with three lines; only two show up in the Accounts overview. My balance sheet completely ignores the “7900 amortissement equipements” account as well. 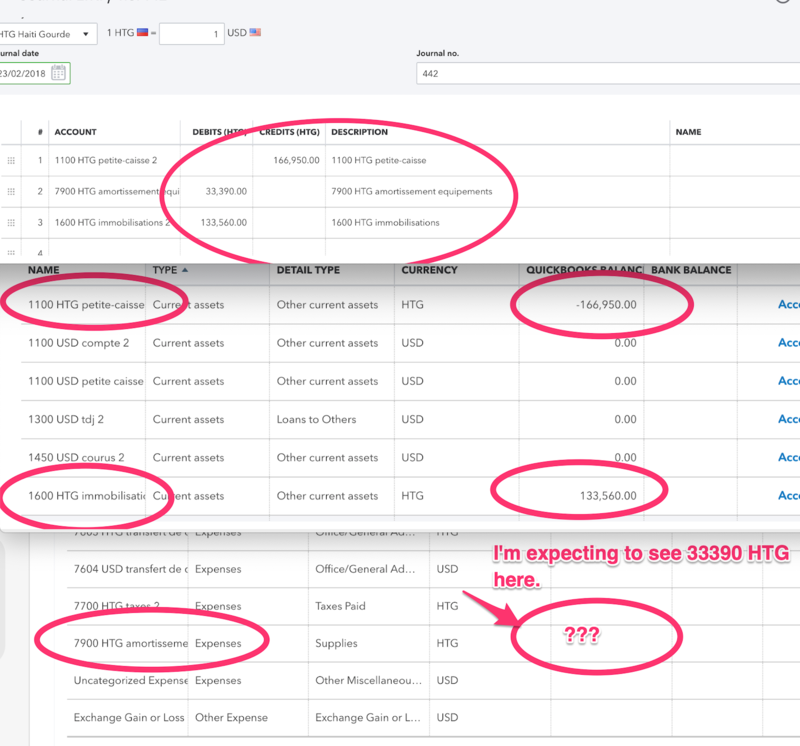 How can I get 33390 HTG to show in my 7900 amortissement equipements account and in my balance sheet?